Director Terry Gilliam had just redeemed himself by bringing in The Fisher King on budget. Despite bad blood with Universal over Brazil, the studio granted him final cut for one of his more intriguing projects. Camus goes back in time to review Arrow’s new 12 MONKEYS Blu-ray. "Locations I've used were old disused power stations around Philadelphia and Baltimore. Nuclear plants, factories, power stations: 'cathedrals of technological progress'. These great spaces were considered to be providing the solution to all of our problems, yet now they're just wasted, lying there, rotting. And that seemed very much what a lot of the film was about. About putting your faith in the wrong things." 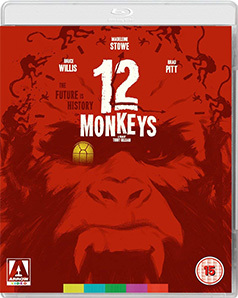 Note: I'm having a short chat with 12 Monkeys' film editor, Mick Audsley on the day of the Blu-ray release, Monday 15th October. You can read that here. I've said before on this site that if stranded on a desert island with only one director's work to choose from, I'd probably go for Terry Gilliam. His films manage to balance extraordinary visuals, far flung and wondrous ideas, great, imaginative narratives all of which feature an intelligence behind the curtain that is forever twitching with the filmmaker's zeal and passion. Yes, there are more 'worthy' filmmakers, more 'worthy' films but for the pure intellectual, visceral, wow (and hamster) factors, I'll stick with the Python animator every time. 12 Monkeys was made in his 'well behaved period' after proving to the studios that he could deliver on time, on budget and still make a successful film, which of course was the delightful and moving The Fisher King. 12 Monkeys is based on the classic French short film made up primarily of stills directed by Chris Marker. La Jetée tells the story of a prisoner in a broken post World War III society who's chosen to drop through time to "call the past and future to the rescue of the present." His own memories lead him to a decisive moment that… and that would be a spoiler even for the vastly different but thematically identical 12 Monkeys. The pre-title text tells us that "five billion people will die from a deadly virus in 1997…" Apparently these are the ravings of a paranoid schizophrenic mental patient in a Baltimore hospital in 1990. 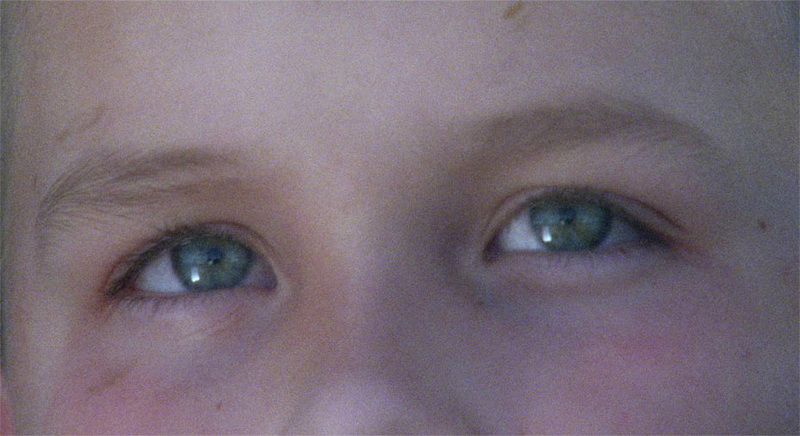 After a visually striking, time-disjointed scene of a man being shot and a woman going to comfort him, we close in on the eyes of a young boy, a witness at an airport corridor (or in French, 'La Jetée'). With a cut to infer that the child is Bruce Willis, we are now in the grubby underground future where time travel subjects (also known as prisoners) are being 'volunteered' by a small group of officiating, high handed bastards, a group including Arthur Dent (Simon Jones) but we will not hold that against him. These men and one woman are looking for information that will help them develop a cure for the original virus. The agents who spread the deadly toxin are believed to be animal liberationists, 'the army of the twelve monkeys'. James Cole (Willis) makes several time travel excursions and develops a touching relationship with the psychiatrist who first had him sectioned in 1990. Dr. Kathryn Railly (Madeleine Stowe) is a rational character whose mind is slowly flipped by a series of inexplicable events which may point to the fact that Cole is authentically time travelling. Cole seems to be from a ravaged future hoping to gain important information from key moments in the past, information that may lead to a cure for the virus so that the relatively few survivors could see the sun again. Or we could be experiencing all these delusions via the damaged psyche of a dangerous psychopath. Gilliam revels in the ambiguities like a pig in the inspiration for the name of his own production company. Willis immerses himself in Cole, is often shoved around, drooling and emotionally and practically naked in many scenes. Filmmakers seem to have independently created 'rules' for time travel that manage to leave the travellers unclothed when they first appear. Gilliam has Cole disappear and appear with a low-tech visual cue used sparingly for when time travel is happening, fast moving shots of monochromatic stair rods apparently, first seen at 43 minutes and 37 seconds in. More often than not, Cole appears and disappears in a single cut to announce his arrival/departure. Cole is the antithesis of John McLane, Die Hard's New York cop, a role that propelled Willis into the Hollywood firmament. Yes, Cole's on a mission but always appears disoriented and has the worst physical luck throughout the film. He even gets shot in the leg and somewhat unrealistically manages to carry on regardless. This is the only bit of 'Hollywood' in the entire movie. But Willis is superb in the role and resoundingly committed. There are two stand-out scenes, both simple in execution, where he is moved to tears and then later exhibits a childlike wonder. Listening to music in the car on the drive to Philadelphia, you see a transformation, a moment mentioned by Gilliam in the commentary, a moment that surprised, scared and delighted the actor who found himself so inside the character he was almost powerless to resist the music and its effect on him. He certainly found his thrill on Blueberry Hill. In a later scene, Cole seems transfixed by a small pool of water in the woods and is thrilled that the air was good enough to breathe. These two lovely moments provide some relief for a character who has been through several mills before breakfast and still has a job to do. In the showier but smaller, supporting part, Brad Pitt as Jeffrey is right up there with Willis. In a role the actor made a great effort to secure, he plays every nervous tic and wide-eyed stare (somehow favouring his left eye) with enough conviction to make Jeffrey both an ally and a threat and someone bouncing off the walls somewhere in between. He's a link to the big bad of the piece, his father, Dr. Goines played with a detached indifference by Christopher Plummer. It's explicitly implied that Goines' work with chemical agents makes animal lives suffer. This makes his far from rational son angry enough to do something about it but also inspires one of his workers to act outside the box. 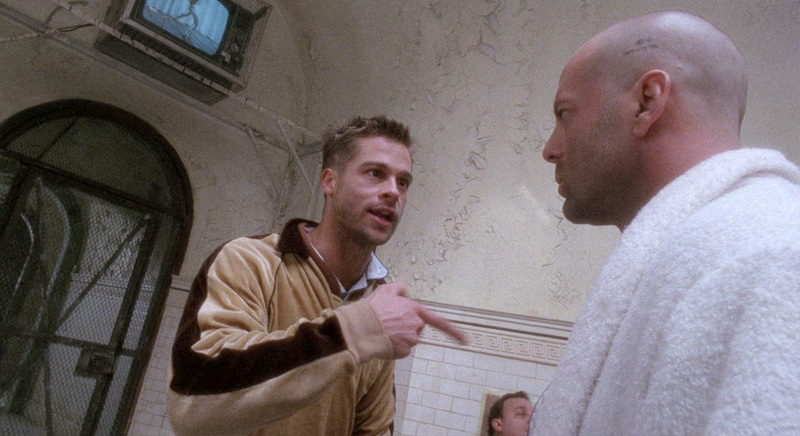 Both Willis and Pitt used 12 Monkeys as a kind of calling card to the rest of the industry that they were both far from one-note performers. The third of the main star line up is Madeleine Stowe whose acting talent gets more than a work out. There are scenes in this film in which she has to go to the moon and back emotionally within seconds and Stowe nails these every time. In many ways, this movie was her last before concentrating on family life. She returned to the business a few years later and now is probably better known for her television work. For me, she will always be Cora, the girl who will be found ("I will find you!") by Daniel Day-Lewis' Hawkeye in The Last of the Mohicans. 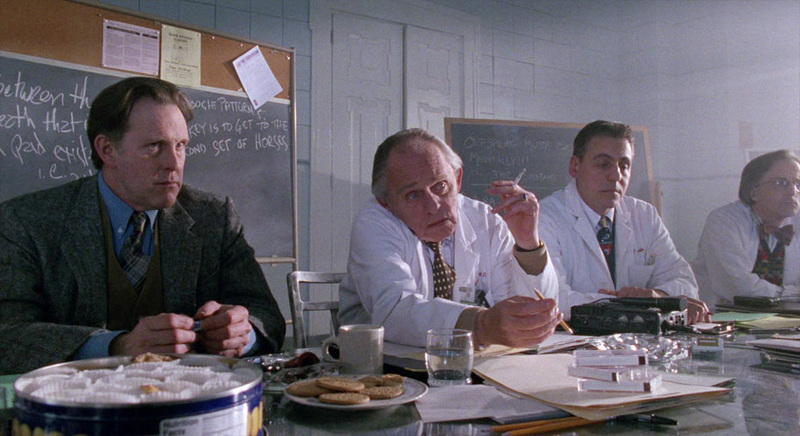 There are many small and incidental pleasures in 12 Monkeys. Gilliam's love of wide-angle photography is present and correct and at moments of stress, the Dutch tilt is artfully employed. The hyper-industrialisation of the underground future is artfully demonstrated and the desolate streets of Philadelphia brought to morbid life with a department store horrifically frozen in mid-Christmas while a choir chants "Sleep in heavenly peace," on the distant soundtrack. It may not come across as horrific to you but I was instantly transported to The Simpsons episode in which it's New Year's Eve 'every day!' One of the revellers says to Marge and Homer "Please, kill me!" I'd go postal if I worked in a department store during Christmas, all that bloody Christmas music, all the time. Speaking of music, 12 Monkeys boasts one of science fiction's most idiosyncratic soundtracks. Inspired by (lots of inspiration in this movie) the Libertango by Astor Piazolla, composer Paul Buckmaster failed to extricate the accordion and tango rhythm from his thinking and with Gilliam's blessing, delivered a twisted tango that kicks in at significant moments. There are heartfelt string compositions in the bulk of the soundtrack but that accordion theme, once heard, is there in your mind, instantly recallable. I find it sad that so few film themes are one tenth as sticky these days. Gilliam cast Frank Gorshin as the head doctor at the mental asylum with the irony that in my generation, he's most famous for playing the notoriously unhinged Riddler in the camp Batman TV series. His response to Willis bringing the medical board up to speed on events of the near future is an absolute joy. Eye-rolling has to be done very well not to fall into parody. His demonstration of disbelief is spot on. There's the world's worst security guard reading about a 'Bat Child' looking like he only just failed the audition for The Hills Have Eyes. 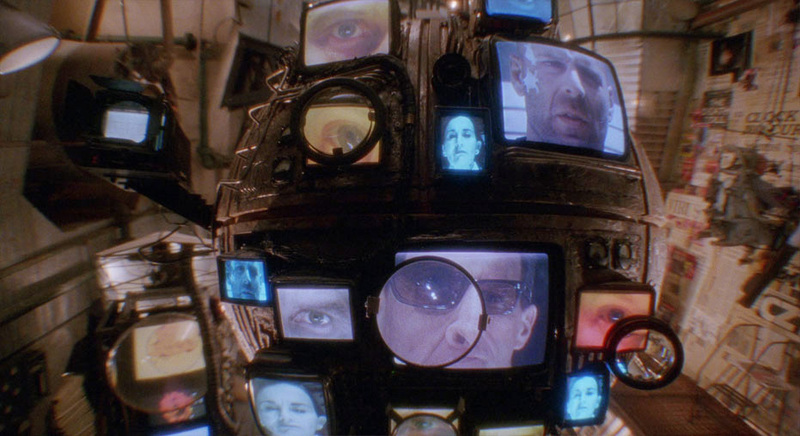 There's the techno-insanity of the video ball, a prop that gave the filmmakers no end of headaches. It would judder to a stop which producer Chuck Roven really disliked but in the end he admitted that it gave the ball character. Screw-ups on Gilliam films are always used to their potential advantage. The visual effects are artful and hugely effective. It feels good to ask of a film's CG "Is that a real giraffe or not?" I never even questioned it. The movie was made at the very start of the CG march to FX dominance. If there is an aspect of the design of the film that may have been improved upon, for my money it has to be the time machine itself which is a man-sized tube which slots into a wall. Now, I can well imagine, not having the budget, you'd be looking for something in what was available (broken down power plants etc.) I'm no great fan of hardware but the only time you see the 'time machine' working is a speeded up shot of Willis encased in plastic, slotted into a wall. Cue the stair rail, monochrome 'time travel' visual motif and bang, we're in the trenches during World War I. I guess Gilliam probably felt that you only needed to see it once (good call) but the stair rods didn't do it for me. I would have liked to have seen what Cole may have seen while he was travelling – perhaps I did! Stair rods! Finally, if there is an image that typifies Gilliam's approach to set design, set dressing and dare I say art, you cannot beat the empty red wine glass sitting on the base of Rodin's famous marble sculpture, The Kiss. A spent cigarette sits in the glass smeared with lipstick. Next to the glass is what looks like a gherkin. That tiny moment is so pure Gilliam that I can't even tell you why. It has struck me over the years that the one aspect of 12 Monkeys that is usually swimming at the forefront of my mind is its distinct dearth of colour. The future is dark, dank, industrial, underground and machine-gunned in detail. 1990 and 1996 have no real standout hues but maybe this is the point. The blood-red stencilled 12 Monkeys graffiti really jumps out at you as does the blood-red, uh… blood and of course, there's the oft quoted slow motion, over-lit flashback/forward scene at the airport, the essential piece of the film's puzzle. So as long as we accept this muted palette, the Blu-ray shows it off nicely. The film has a celluloid softness that's in the negative's DNA and grain is never intrusive. There are two choices for the soundtrack, English Surround and English Stereo. Both are distinct and clear but the surround edges out the stereo because I love surround sound and perhaps the lower frequencies have a little extra punch but that might be my own bias and not the sub talking. "In a penthouse suite surrounded by beautiful men and women and drinks," says Terry… OK! Ported from the 2005 DVD release, the commentary has inevitably dated – a lot can happen in home entertainment in 13 years. As I wrote before but actually mention later, Gilliam is always great value. Here is a smart, hugely creative and generous man. As he is still talking to his then producer nine years after the film was made, says volumes about the friendship that endured. I could listen to these two for four hours without pause. They manage to articulate the exacting creative process in terms of practical filmmaking, something non-filmmakers often fail to grasp. Steven Spielberg in his earlier years once said that if he was asked advice about how to direct a movie, his reply was "Just get through it," which is pretty good advice. Once a film is greenlit, the director works with an upended pyramid of pressure on his/her shoulders and the weight of it can only get heavier. Gilliam and Roven bounce around and more often talk generally about the process but every now and again one or both will drill down to a scene specific or shot specific anecdote. Was surprised that Gilliam let the hamster shot go but he does bring it up in the latter stages of the commentary. One of the great aspects of directing is that for good or ill, the director must take responsibility for everything (including everyone else's great ideas). It's nice to hear some bald honesty on this subject from Gilliam. He notes that Bruce Willis was supportive of the supporting role (the madness of Brad Pitt's Jeffery Goines). Remember in 1996, Willis was an exploding superstar but narrowly only as John McLane. He could have played the star card but took a cut in salary to flex his acting chops and Gilliam is nothing but compliments for his star. The point is brought up that like very few movies, you really had no clue what was going to happen from one scene to the next, a sign of a great script if you are compelled to keep turning the pages. La Jetée director Chris Marker contacted the producers saying that he was proud to have had a small influence in the film. Gilliam reveals that he was paid and did very much appreciate the payment. If there are 'Making of…' rankings, this is in the top three. This is an "I was there" throughout each stage of the filmmaking process not just a puff piece after the fact. Gilliam is remarkably generous with his time and exposure but then again, he did insist he wanted a complete record of the making of his movie in a sort of pre-emptive strike against the threat of malicious studio interference! Because it is so comprehensive and whitewashes nothing, you get the impression that despite a lens size and an edit getting in the way of truth, this is about as 'real as a 'Making of…" can get and so major kudos to the filmmakers. Gilliam as Gilliam is always entertaining. His personality and passion cannot be contained but I got the impression from the non sequitur questions that this has been very tightly edited. Now I know that things are edited (been doing it myself for 35 years) but if the clips were just excised, it seems as if the editor Penny Spencer waited until clapping had died down perhaps but the cut to the next question which comes out of nowhere is very hard. And there are harder cuts coming out of Gilliam. I wonder if the editor was specifically directed to get under a certain running length. I'm just curious. It's no criticism. Gilliam talks about the hamster, traditional effects work and the lies and the truth behind the ballooning budget of Munchausen. Gilliam's relationship with Robin Williams comes up including the actor's guilt at earning six million not to be Robin Williams. The applause cuts in really sharply too. Just saying. The ever-dependable film writer Ian Christie walks us through his dealings with Gilliam (Christie has written a book on the filmmaker) in a single mid-shot with clips interspersed. Why in these extras am I always straining to see the book titles on the owner's bookshelves? The best wallpaper in the world, book spines. Being used to being in control of the presentation of stills and other marketing images, I was somewhat taken aback by the presentation of the artwork here. Each picture gets less than a second of exposure and if it's my kit, I apologise to the Blu-ray producers but I couldn't make it pause or slow down at all. I kept getting "This operation is not available," messages. The presumably standard definition images of all aspects of production are intriguing but would have been more so if they'd been of a higher quality and able to be perused at one's own pace. As they go by so fast and my memory is not great, I remember the images being broken down into headings; Logo Designs, Costume and Production Designs, Location Photographs (there is a section labelled 'Producer Charles Roven', followed by loads of pictures of Gilliam…), Storyboards, Storyboards (not a typo, that heading is listed twice), Production Photographs, Costume Diaries and finally Poster Concepts. This is a complex and intriguing effort. You have to feel sorry for the marketing team. This is not a movie that slips into the soft sell like cold feet into a comfortable sipper. But whenever possible, Bruce 'in action' is at the forefront. In fact almost all the violence in the film is previewed. Well, I guess if you have Bruce Willis, you exploit your assets. Gilliam remarks that nothing puts off an audience more than if their expectations are not met. It's a miracle movies like 12 Monkeys (used to) get made because how the hell does an audience set up expectations for a film like 12 Monkeys? Given this trailer, I think they did a good job of whetting the appetite for something out of the ordinary. Also included with the first pressing only is an Illustrated Collector's Booklet featuring new writing on the film by Nathan Rabin and archive materials, but this was not available for review. 12 Monkeys works as a science fiction piece, a jigsaw time-travelling mystery and an ambiguous hike through the mind of a disturbed individual. All of the performances are excellent across the board and the conclusion is eminently satisfying. The actual Willis/Pitt 'star power' is almost an irrelevance. 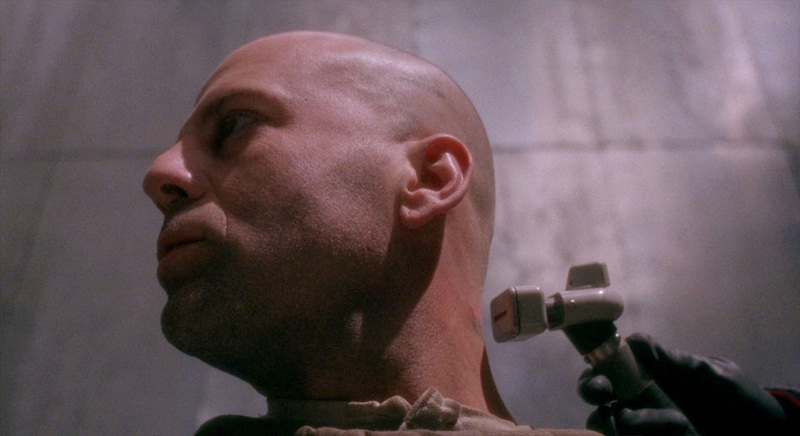 It's one of Gilliam's strongest works and a cracking film in its own right.